Come support one of the largest art walks in the city since 2003. 18th St. Pilsen Open Studios is an artist run art walk that takes place during the third weekend in October to celebrate Chicago Artist's Month. For the last 7 years artists, galleries, spaces and cafes open their doors during special hours. The art walk includes over 30 spaces, 60+ artists in locations from Western Ave. to May St. and from 16th St. to 24th St. This year we are happy to announce our fundraiser will be on Wednesday, August 18, 2010 at the National Mexican Museum of Art, starting at 6:00 pm to 11:00 pm. 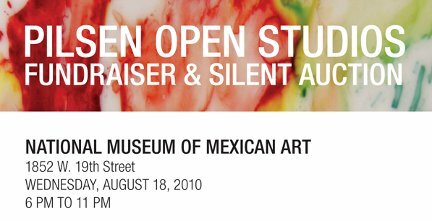 There will be a silent and live auction with donated artwork from great artists who come from different parts of the world: United States, Mexico, Venezuela, Honduras, Brazil, Colombia, Panama, Puerto Rico and reside in the Pilsen area, or are invited to participate. Artists participating are: Robert Valadez, Salvador Jimenez, Alejandro Jimenez, Gabriel Villa, Angel Silva, Diana Solis, Jeff Abbey Maldonado, Guillermo Delgado, Magda Dejose, Patricia Peixoto, Roberto Ferreyra, Mark Nelson, Montserrat Alsina, Hector Duarte, Omar Valencia, Miguel Cortez, John Pitman Weber, Pablo Serrano, Mariko Ventura, and many more. Foods and drinks will be provided by many of our local cafes and restaurants. This year we are celebrating with a gathering of local musicians representing music from Veracruz and other parts of Latinamerica: Tarima Son, Fandanguero and Son del Viento. Special preview presentation by Tarima Son.